Stephen is believed to have been a Greek Jew who converted to Christianity. As the number of disciples increased, there was confusion over the distribution of alms and the serving of the poor especially those who were originally of Greek descent who said they were being discriminated against. 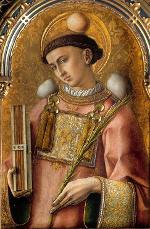 Stephen was chosen as one of the seven deacons who would distribute alms. He was an excellent and well trusted orator. His preaching style was very effective and many Jews in the synagogues became worried about his success in converting people to Christianity. The Jews accused him of blasphemy and he was made to stand trial. At the supreme Jewish law court, the Sanhedrin, Stephen recounted the many mercies that God had given the children of Israel, and the ungrateful way in which they had repaid Him. He made a speech in his defence which takes up most of Acts chapter 7, in which he accused them of murdering Jesus, whose coming, he said, had been foretold by Moses. This angered the crowd and he was dragged out onto the streets. He was then stoned to death, an event witnessed by Saul, later of course known as St Paul. It is believed he died around the year 34CE.